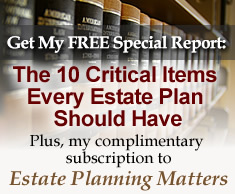 5 Components of a Good Estate Plan | The Levin Law Firm - Philip Levin, Esq. Many people believe that if they have a Will, their estate plan is complete. However, there is much more to a complete estate plan. A comprehensive plan should be designed to protect clients in the event of an illness, injury or incapacity, as well as their assets should the client need long-term care. A well-designed estate plan should also appoint financially responsible individuals to serve as Executors and Trustees, to act on behalf of the client in the event of their passing, in order to ensure that the right property distributes to the proper party, at the correct time. Last Will and Testament – A Will is the legal document which sets out the terms and provisions for the distribution of property in the event of death. If your client does not have a valid Will, state intestacy law will determine how their property is distributed. A Will also appoints one or more Executors to carry out the wishes of your clients. Wills are especially important for clients who have minor children because a Will can also designate a Guardian to handle the job of raising a child, as well as managing assets for children until they attain specified ages. However, a Will only handles the distribution of probate property, which are assets held in the individual name of your clients. Many types of property pass outside the probate process, including jointly-owned property, property managed in trust, life insurance proceeds, and property with a designated beneficiary, such as annuities, IRAs, and 401(k) plans. These non-probate assets distribute by contract, not under the terms of a client’s Last Will and Testament. Trusts – A Trust is an agreement in which the client appoints a Trustee to invest, manage and distribute property to one or more beneficiaries. Trusts often are designed to have one class of beneficiaries during those beneficiaries’ lives and another set — often their grandchildren — who continue to benefit after the first group has passed away. There are many different reasons for setting up a trust. The most common reasons are to provide asset management, and insulate assets from the potential claims of creditors and predators of a beneficiary. When clients establish a Revocable Living Trust during their lives, the Trust can terminate at their death or continue in trust for one or more designated beneficiaries. Trusts can often save time and money for the beneficiaries. A Trust can also be very useful since assets invested in a Revocable Living Trust avoid probate upon death and provide valuable asset management benefits, wherein you can be appointed as Investment Advisor by your clients for their surviving family members, if they desire. Testamentary trusts can also result in significant tax advantages for your client’s spouse and other family members. These trust-based plans often include “Credit Shelter Trusts” and “Life Insurance Trusts”. Clients often establish trusts to protect their property from creditors or to help them qualify for Medicaid, if future long-term care expenses are an important concern. Unlike Wills, a trust is a private confidential document, which is not probated upon the death of a client. Provided the trust is well- drafted, another major advantage of trusts is their continuing effectiveness and continuity of investment management, even if the donor becomes ill, incapacitated, or passes away. Durable Financial Power of Attorney – Powers of Attorney are the legal documents which allow your clients to avoid a guardianship proceeding by appointing a responsible person to serve as Agent, in order to make necessary financial decisions on their behalf. More specifically, a Power of Attorney allows a person selected by your client to act for purposes of making financial decisions if the client ever becomes incapacitated. Without a durable financial Power of Attorney, a family member may need to petition the court to appoint a guardian. That court process takes time, costs money, and a judge may not choose the guardian your client would prefer if given the choice. In addition, under a guardianship proceeding, a court-appointed representative may have to seek court permission to take planning steps that could easily have been implemented immediately under a durable financial Power of Attorney. Health-Care Power of Attorney and Medical Directives – A Medical Directive may encompass a number of different documents, including a health care proxy, a durable Power of Attorney for health care, a living will, and medical instructions. Both a health care proxy and a durable Power of Attorney for health care designate an individual to make health care decisions if the client is unable to do so. A living will instructs providers to withdraw life support if the client is terminally ill. Health-Care Powers of Attorney generally include a living will, but will also provide specific instructions if your clients are unable to direct their own health care decisions. Beneficiary Designations – Although not necessarily a direct part of an estate plan, at the same time clients establish their estate plan, they should make sure their retirement plan beneficiary designations are up-to-date. If a beneficiary is not designated, the distribution of benefits may be controlled by state or federal law or according to the terms of a particular retirement plan. Some plans automatically distribute money to a spouse or children. Other plans may distribute funds to a retirement plan holder’s estate, which could have negative tax consequences. The best method for distributing assets from annuities, life insurance, qualified plans, and IRAs is to designate a beneficiary. Please feel free to share this edition of Estate Planning Matters with your clients who need to establish or update their estate plans. At The Levin Law Firm, we try to make the estate planning process as simple and convenient as possible. When your client is ready to schedule their initial consultation, our Estate Planning Fact-Finder contains valuable tips on how to prepare for their Estate Planning Consultation.